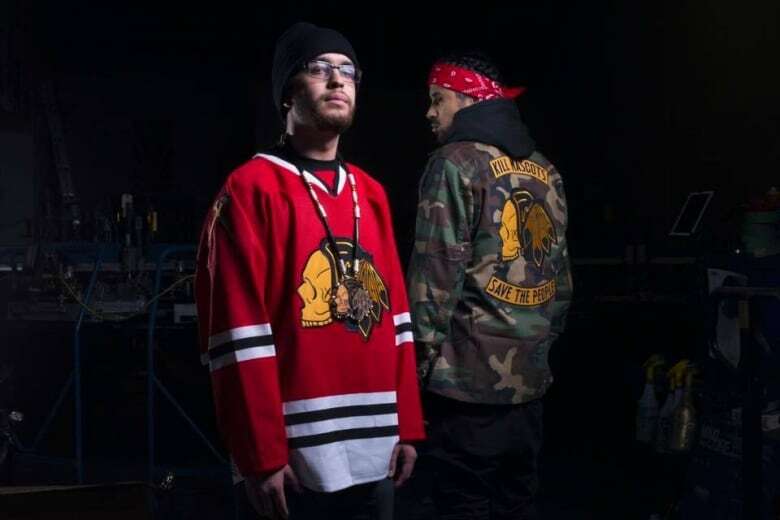 When Quinton “Yung Trybez” Nyce and Darren “Young D” Metz first started performing as the Snotty Nose Rez Kids, both were dealing with deep, personal struggles. When Quinton "Yung Trybez" Nyce and Darren "Young D" Metz first started performing as the Snotty Nose Rez Kids, both were dealing with deep, personal struggles. Nyce lost his brother to suicide. "I'm a pretty cheerful guy but I was in a slump, in a weird, dark space. I couldn't get out of it," he said. "To get out of it, I had to lay everything off my chest that I had to, and that was in the first album." That first album, titled Snotty Nose Rez Kids, had moments of profound sadness mixed in with bits of humour and lightheartedness — and captured how the two lived their lives in Kitamaat Village, B.C., growing up on the reserve. 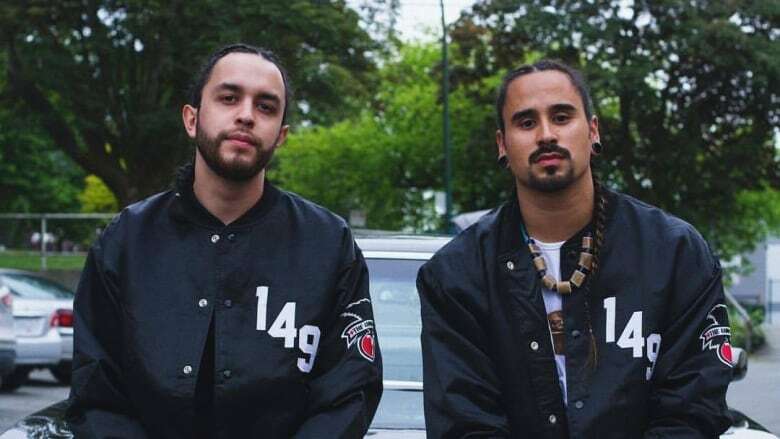 Their second album, The Average Savage, zeroed in on stereotypes placed on Indigenous people by pop culture. It propelled them to the national spotlight, and was shortlisted for the 2018 Polaris Prize. Nyce and Metz are working on their third album, slated to come out in early 2019, using their newfound fame as a springboard to make a dent in North America's hip-hop scene. "It's been wild. When we first started doing this, we started doing it for ourselves," Nyce said. "When The Average Savage got shortlisted, it showed that people actually cared about our message and what we were talking about." But really, Indigenous fans have always cared about the message the Snotty Nose Rez Kids have had — because it captures their lived experience. A fan from the Yukon had the lyric "you ain't dead to me, you're free now," from the song Black Blood, tattooed on his arm. For Metz, it was validation that their fans were living through the same hardships they were. "It was unreal," he said. "It just lets you know that you're not the only one that feels this way. It's important to talk about those sad emotions in order to move on." Nyce wrote that lyric for his minay, a word they use to describe brother or a brotherhood. He remembers hearing the news of his minay passing in a hotel room, preparing to go to a Kanye West concert that night. "That whole verse, for me, was exactly what I went through from the minute I found out until the minute of like, cremating his stuff and letting him go," Nyce said. He said during the send off, on an otherwise-overcast day, the sun peeked out for a moment. "That's when I was like, 'you're not dead to me, you're free now,' and when I put that in the lyrics, that really meant a lot to me," he said. "Even to this day, it's still happening," Metz added. "Last month, I lost my cousin to suicide. It's still real. And even though it's uncomfortable to talk about, it needs to be talked about." Those sombre moments will continue to weave themselves through their next record. Both Metz and Nyce have been on a writing frenzy over the past year and a half. The pair credit their Polaris nomination and Lil Wayne's Tha Carter V drastically reshaping what they've ended up with. "I basically rewrote everything after Tha Carter V dropped," Metz said. "I was also motivated for not winning the Polaris Prize, I was like, 'that's not good enough, I'm rewriting it.'" "We're probably dropped like, five songs because we're not that person anymore," Nyce said. They're working with a new record label, a new producer and some newfound desires — after losing the Polaris to Jeremy Dutcher, they know they can be better. And in that, they're hoping their evolution from their last two records will continue to push their trajectory upwards. "We've grown so much as artists," Metz said. "We're really showing people not just the politically charged side of us, but we're also showing our own personalities." U.S.-based National Suicide Prevention Lifeline: 1-800-273-TALK (8255).